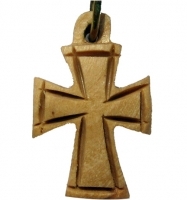 Increase your religious style with custom and elegantly crafted olive wood cross necklaces for men. Acknowledge you spiritualism and Christianity with cross necklaces. Browse our wide assortment of discriminating olive wood items, products that are gorgeous and impeccable. Simple, yet extremely beautiful, our cross necklaces made from Holy Land olive wood are one of the most popular category crosses that people enjoy. All sizes and types can be purchased at HolyLand-Gifts.com. With a variety of crosses to choose from, feel closer to Christ as each and every cross is made by Christian artisans from Bethlehem. These necklaces are meant for both men and women, while they come in a variety of different styles and sizes. Moreover, they come in a number of different finishes and patterns to suit specific religious needs of men who proudly wear them around their neck. The cross is a symbol of eternal life, Cross Necklace Men are ideally suitable for using as First Communion, Baptism, and Confirmation gifts, and many more occasions. Interestingly, all high quality products that are available on our website are affordable for any and all budgets. Excellent workmanship, excellent customer service and excellent products, I buy cross necklace from here. The quality of poducts great.